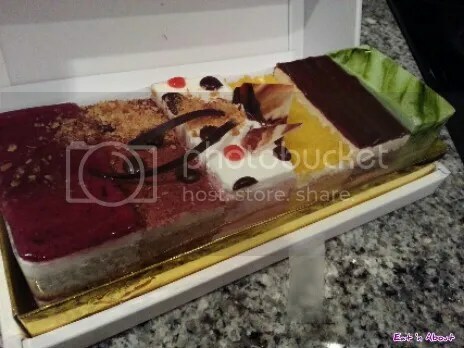 At first, Hitman wanted to take me to the rice cake cafe (Midam Rice Cake House) in Coquitlam for dinner and dessert/birthday cake since he knows I love rice cakes. When we arrived, we quickly realized that the reviews online were right…if you didn’t speak Korean, you are knee-deep in bad stuff. Hitman asked me to visit the grocery store next door to see if I’m interested in any cakes there, in case I didn’t want anything here. So I went next door, during which time Hitman, being the sweetheart that he is, actually ordered a piece of cake for me and it was to be a surprise. He repeatedly instructed the server that it’s “my girlfriend’s birthday, so it has to be a surprise, don’t mention anything.” The server (Server 1) then got another server (Server 2), who apparently spoke better English, to come over and listen too. Hitman was sure that everything would be fine, since they had even managed to understand his request for a candle. So I come back, not knowing what’s going on. Server 1 comes back and right in front of me, informs Hitman that they didn’t have banana flavor left just chocolate and yam. I could see Hitman’s face drop and frustration and anger build up. I tried to comfort him saying that I was surprised enough, and that I didn’t expect him to order anything to begin with. But the damage was done. He was very very dejected and angry. I managed to calm him down. Until the food arrived. The wrong food. 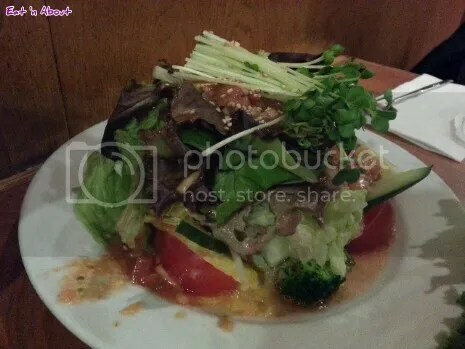 First of all, when we ordered the food, we pointed to the exact picture, and Server 1 repeated the English back to us also. So when Server 2 came and brought me the wrong one, I politely told them, “No. This is not what I ordered.” Server 2 looks confused, goes to ask Server 1. Server 1 comes back and in her extremely broken English, tries to tell us that Server 2 is new. What difference does that make??? Server 1 took the order! Server 2’s only bringing it out! With this, even I was fed up. So we walked out. By now we were both pretty frickin’ hungry. So Insadong was mutually agreed upon. As we got closer the intoxicating aroma was just too much to take. 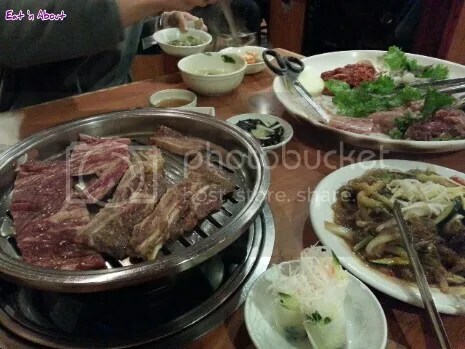 We ended up ordering the Couple’s BBQ combo ($59.99). Along with the banchan came the Radish Seaweed Roll seen in the centre above. It was supposed to be in a sweet and sour garlic sauce. However to me it just tasted like pickled radishes and cucumbers rolled up in a thin sheet of pickled radish. It was cool and refreshing though and I still enjoyed it. Their kimchi though I found too sour…likely because it’s not the freshest. The Beef Salad was greatly enjoyed by Hitman. There was pieces of barely, barely cooked tender beef and it went along very well with the slices of pineapples. This was a fairly big size and we barely finished it. 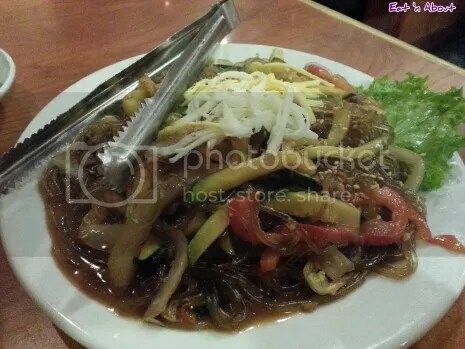 We get 2 choices next, and for one of them we picked the Bulgogi Japchae. Not much to say here it’s pretty yummy as usual, pretty standard fare. Could use a couple more pieces of bulgogi though. Then there were the big guns. 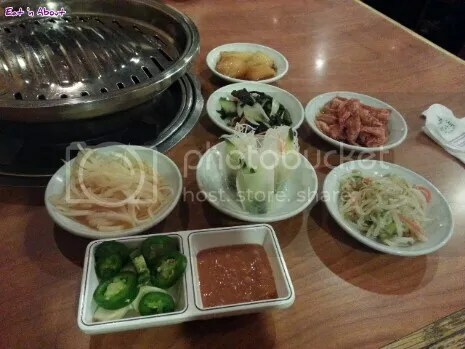 Included were Marinated Beef Ribs (gal-bi), Marinated Beef Bulgogi, Marinated Chicken Bulgogi, Marinated Spicy Pork Bulgogi, and Marinated Short Ribs. Some seafood too; mussels and yummy prawns. The menu apparently says oysters too but we didn’t get any…but I think they gave us more prawns in exchange. 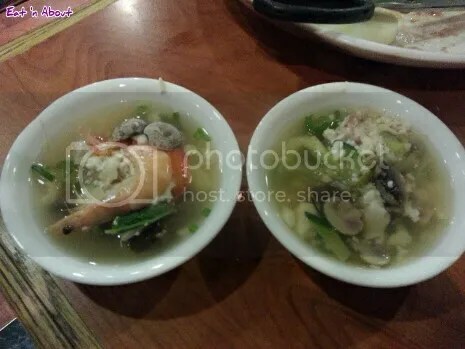 The prawns were very “bouncy” and delicious so no complaints there. The meal was absolutely delicious. The servers were quite good with the changing of the hot plate too. We had a minor kerfluffle when paying though but that’s the only bad part of the night here. The whole deal with my birthday cake this year was this: We usually have my birthday cake at my family Christmas dinner, since my birthday is the day before. But this year, instead of getting the birthday cake I wanted, my mom got a Christmas log cake instead because she really liked it. That got me kind of bummed, so Hitman said we could get our own cake! We got my birthday cake from the bakery inside H-Mart. We chose the assorted one just so there’s a variety to choose from. And they were so pretty! From the left, we have Blueberry Sponge, Cappuccino Sponge, Strawberry Sponge, Pumpkin Sponge, Choco Ganache, and Green Tea Sponge. I was most excited for the Pumpkin Sponge. In the end the best tasting ones were Blueberry and Strawberry as both of these tasted very authentically of the fruit. However all the cakes were extremely sweet. I would’ve thought that they would be just slightly sweetened much like Hong Kong style cakes, but I guess Koreans like their cakes sweeter. I still much prefer our cakes.